This episode is a recording of our recent live broadcast in which Cory discusses magical objects, gifts, and ‘things’ with fill-in co-host AthenaBeth Black and guest Achija Branvin Sionach. You may want to look back at Episode 11 – Magical Tools, which touches on a few of the points discussed in this episode, as well as the discussion between Laine and Cory on Episode 108 – Doing Magic for Others, which mentions the idea of magical gift-giving. We recorded this broadcast via our Mixlr page, where we host occasional live chats that we’d love you to be a part of! You should, of course, check out AthenaBeth’s channel on YouTube, where she discusses lots of different witchy topics, including her favorite magical things. If you’re looking to make a favorite book a little more special (magical or otherwise), Achija’s Spellbound Bookbinding page will show you some of his bookbinding work and let you request your own project. We mention a few different sites that are worth checking out, such as Sage & Salt and Lady Jayne’s Brewery. We’re also planning an excursion on June 3rd to see the ancient magical artifacts exhibit at the Penn Museum and we’d love for you to join us! You can find out about it in our Special Update post on it, or check out the Facebook Event page. We’ll also have a cemetery tour/ghost walk that afternoon! One of the longest-standing charges against witchcraft in the New World (as well as the old) is its inherent alliance with diabolic forces. A person simply could not be a witch without being bound in some way to the Devil or one of his minions, according to popular conceptions which remain strong even today. The notion of witchcraft as a Satanic practice is, of course, inaccurate—many Satanists have nothing to do with witchcraft, and many witches have nothing to do with Satan (that name here being used for the Adversary of the Judeo-Christian God). There are certainly Satanic witches, just as there are Jewish witches or Christian witches. I prefer to draw a distinction, though, between Satan and the Devil (or devils in general, the capital “D” being used when referring to a singular entity). In most cases, Satan appears in biblical lore as a being concerned with the overall cosmology of heaven and earth, leading wars against God, and presenting deep philosophical and theological complications into the story of Creation. 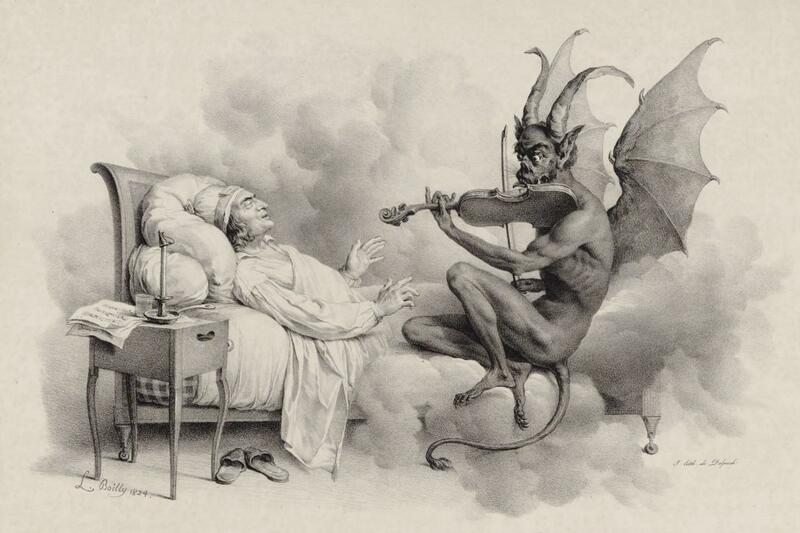 Devils, on the other hand, are creatures interested in particular individuals, usually offering them power or temporal gifts in exchange for a soul, a service, or as a reward for exemplary cleverness. They stem from myriad sources, including the Teutonic Teufel, the trickster spirits of African and Native American mythology, the Norse Loki, and British devil-figures like “Old Nick.” Today, I’ll be looking at the Devil and his role in American witchcraft, particularly his place as an Initiator and a Trickster. 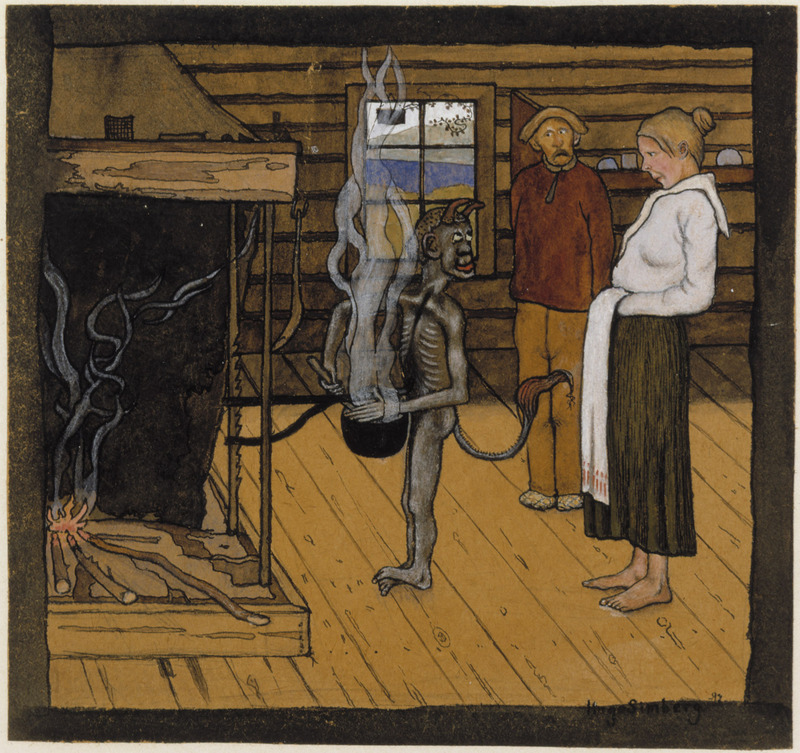 The life of someone near to her – “I am told, by women who claim to have experienced both, that the witch’s initiation is a much more moving spiritual crisis than that which the Christians call conversion. The primary reaction is profoundly depressing, however, because it inevitably results in the death of some person near and dear to the Witch” (OM&F, p. 268). A bit of her own flesh or blood – “If, through a pact, the devil is granted your soul in exchange for some talent, gift, or magical power, it is thought that he then receives some gift of the body in return. This could be a fingernail or even a withered finger” (SC&W, p.164). The gifts gained by becoming a witch through compact with the Devil often must be exercised regularly in order to remain potent. Lapsing in witchcraft seems to lead to torment on the witch’s part if the Devil finds that she’s not been keeping up her end of the bargain by using her powers. I would posit that while the folklore here superficially portrays the Devil as a cruel master, he may instead be a necessary goad. After all, what great musician or momentous artist ever became who they are without practice? Again, the Devil may be a stern teacher at times, but one that provides the necessary impetus for improvement in one’s craft. In all of these particular aspects—mentor/sponsor, gift-giver, book-keeper/librarian, school-master—the Devil rather reminds me of a faculty member at a university, taking a student under his wing, and helping the young witch succeed in her field of calling. But that may just be thoughts spurred on by my gearing up for graduate school again. Because imagining the Devil as some doddering old professor is foolhardy at best. He is, of course, more dangerous than I give him credit for. Tricksters are common in a number of cultural mythologies, and often have somewhat unsettling or frightening sides. Because of these attributes, the Devil makes a perfect candidate for chief trickster in many folk tales. Just as often as he tricks someone, though, the Devil also gets tricked or outwitted in some way. This flip-side to his role provides a number of amusing tales, but I tend to think there’s a subtle willingness to play the fool on the Devil’s part, making the whole scenario one big trick in the end. But I’m getting ahead of myself. The lore about trickster Devils is not a New World phenomenon, of course. There are several tales from Europe and Africa which feature a Devil or a diabolical trickster figure of some kind, such as the Grimm’s tale “The Devil’s Sooty Brother” or the Ashanti tales about Anansi the Spider (see Podcast 26). Native Americans, however, also seemed to latch on to the concept of the tricksy Devil, and either came to the campfire with their own Devil tales or allowed a Devil to be integrated into their storytelling at times. A legend recorded by Charles M. Skinner in 1896 discusses a land dispute between the Devil and the Long Island Native tribes which resulted in the creation of a natural landmark (see “The Devil’s Stepping-Stones”). “Who are you?” he [Tom] asked. “I think you are the devil,” blurted Tom. “At your service,” replied his majesty. 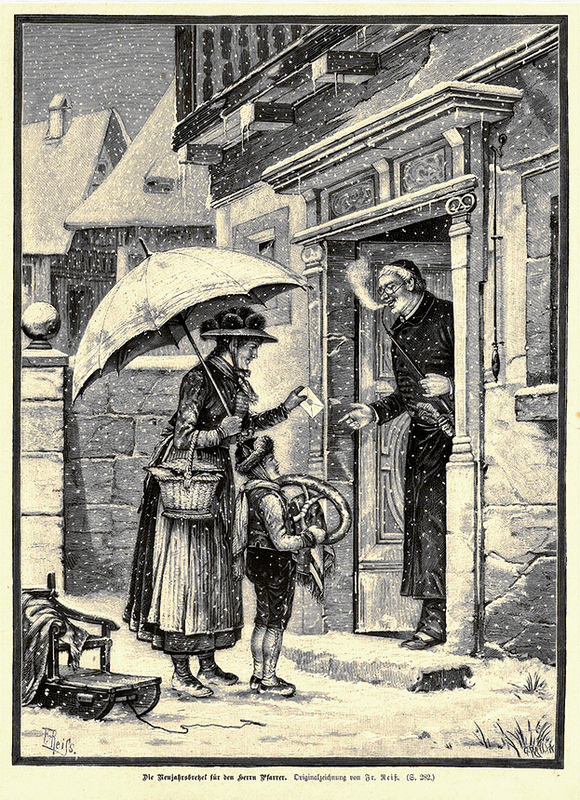 The Devil coaxes Tom with the promise of treasure, which he at first resists, instead sending his wife to collect it instead. When she disappears, he enters into his Faustian bargain and uses the money to set up a usury business. He attempts at every turn to outwit the Devil, keeping a Bible on him at all times and even burying his horse feet up so that if the world turns upside down on Judgment Day, he’ll have a running start in escaping his fate. Of course, the Devil finally catches Tom and spirits him off to hell, leaving behind only cinders and ashes in place of all his money and possessions. What interests me about this particular tale is that unlike the European Faust, Tom Walker has no interest in magical gain or supernatural powers—only money. Well, money and getting rid of his wife, that is. Sometimes the Devil’s trickster competitions are with angels, saints, or even God. In these cases, the Devil almost always loses, but often whatever occurs in the story has some lasting impact on the world. The catfish, according to one Southern folk tale, gets its distinct and ugly appearance from a brush with the Devil. God created the fish, then took the evening off to go up to the “Big House” with his archangels and eat supper. When he came back down to the river, the Devil was sitting there descaling the fish. God demanded he put the catfish back and the devil agreed. The catfish rolled in the mud to make up for its lack of scales but never grew them back again (Leeming, p. 59-60). Sometimes, though, people don’t quite get the best of the trickster Devil, and pay a gruesome price. Zora Neale Hurston records the tale of High Walker in her book, Mules & Men, in which the titular Mr. Walker gains necromantic powers from the Devil only to eventually be tricked into losing his head, literally, in a graveyard. Milne also asserts a connection between the rattles placed in the instrument and a similar practice in West Africa, something I’ve not had time to research but which adds an intriguing layer to this particular custom. Well that’s it for the Devil for today. I have a feeling he’ll be coming back up periodically. When he does, hopefully I’ll be ready for him. Perhaps I should start some fiddle lessons? Forest Grove Botanica – The store of Sarah, the Witch of Forest Grove, whom we’ve had on our show before. Now, I’ve linked to her shop in the past, but as of yesterday, she launched her site independently, so it no longer relies on Etsy to provide transactions and listings. And it looks like she has really been expanding her wares, too. She’s including all sorts of wonderful products, like Witches’ Salves, herbal smokes, oils, potions, and incenses. I’ve already placed my first order, and I’m sure I’ll be getting lots more from her in the future (especially once she gets her Art section up and running). Alchemy Arts – This is the store I mentioned from the Chicago-land area in Podcast 17 (and which I incorrectly called “Alchemy Works,” sorry!). I seriously spent a lot of time and money in this shop, and I wish I could have spent more of both there. This was a phenomenal place, and the owner really knows his stuff. If you’re in the area, stop by. Or you can call him and he’ll help you get exactly what you need at a fair price. If you have favorite shops you’d like to recommend, please comment and do so (if you can provide links, that’s helpful, too)! I know that I’ve been a bit scanty on blogging lately, for which I apologize most profusely. Unfortunately, I’m likely to stay busy with many irons in many fires for quite some time to come, but I feel like you readers are wonderfully patient with me when the blog and podcast have dry spells and I want to reward that. And so, I have put something together for those of you who have been taking an active interest in the recent cartomancy posts. It’s a PDF and should be easily readable with Adobe Reader. Like I said, it’s totally free. Feel free to save it, copy from it, distribute it, etc. Please do attribute any citations, excerpts, or references back to me, but otherwise, I hope you enjoy it! And if you do like the book, consider making a donation here, or with the button on the sidebar. I’m also planning to revise this material, with some additional sample readings, expanded information, a quick-reference chart, and improved graphics and release it as a chapbook sometime in the near future. The printed chapbook will have a cost of some kind (and will probably be sold through our Compass & Key Etsy shop, which I’m hoping to revamp and relaunch soon), but I’ll try to keep it very reasonable. The e-book will remain available through the site, however, and I intend to keep it free/donations-only for all to download. I know it’s nothing spectacular, but I hope it is useful to some of you. Thank you all so much again for your patience and your patronage of New World Witchery, both blog and podcast. We really appreciate your support! Thanks for reading, and be well!